Our company has vast experience in providing general and specialised moving services. We offer you an easy way to hire skilled man and van to lend a hand with your upcoming removal. From full property removals to single item pick-up and delivery – we are there to handle your items with care. Available for hire seven days a week, our movers will make sure your move is taken care of in the fastest and most convenient way possible. Highly reliable moving professionals with premium vans. Full goods in transit insurance coverage and safe transportation. Transport items A to B on official non-work days and outside normal work hours. Easily book skilled and reliable man and van experts - seven days a week. OUR EXPERIENCED MOVERS WILL HANDLE ALL YOUR ITEMS WITH CARE. EACH ITEM WILL BE PROPERTY PACKED, LOADED AND TRANSPORTED TO ITS NEW DESTINATION WITH ZERO RISK OF DAMAGE. Opt for the most family friendly house moving service offered in the Greater London area. We can easily handle small removals and single item deliveries with the necessary speed and professionalism. Transport furniture without any risk of damage, scratches or bending. Be sure to get the lower rates for moving services and our special discounts. Hire Man with Van London is ready to provide you with comprehensive man and van services in London at any day of the week and at any time of the day. We are known for our affordable prices and for the fact that we always offer a 100% service satisfaction. Book us and we assure you that we will not waste your money or your time. 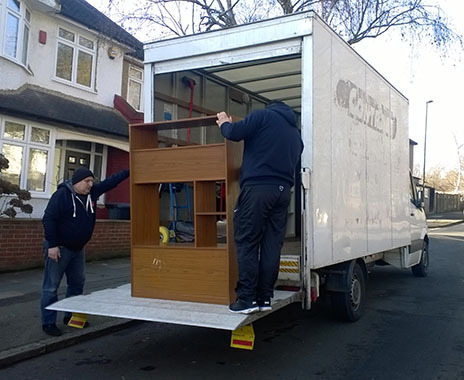 Our team of reliable and trained moving van experts in London is fully equipped and can carry out a wide range of professional man and van jobs both quickly and meticulously. That is because they have a great deal of experience in the industry and they are very motivated and diligent. Our convenient man and van services in London are incredibly versatile since they will meet your needs regardless of whether you need a hand moving out of your home or removing rubbish from your property. We are also available for delivery jobs of any nature and scale. No matter your requirements, the quality you will enjoy will always be outstanding. Yet we cannot say the same about our prices since they are unbelievably low which easily makes our effective man and van solution in London among the most competitively priced such services in the industry. We from Hire Man with Van London rely on a massive fleet of modern and insured moving vehicles. Our vans and trucks are maintained in an excellent condition and they are available in pretty much any size. Therefore, we have the ability to provide you with our trustworthy man and van assistance not only for small and simple man with van jobs but also for more complex and challenging projects. We are a trustworthy company since we are properly registered, seasoned, fully insured and flexible. Our armada of moving vehicles is equipped with various protection features which is just one of the reasons why our clients get to enjoy such safe man and van services in London. Get in touch with us and enjoy most competitively priced man and van services in London. London is a busy city not only because it is inhabited by a lot of people but also because it is visited by millions of tourists every year. Aside from attracting travellers from all over the world with its impressive landmarks, stunning architecture and prestigious shopping streets, the Big Smoke lures people of various nationalities with the countless annual events which are held on its territory. Many of them are related to sports and include the London Marathon, the Oxford and Cambridge Boat Race and the world’s oldest tennis tournament – the Wimbledon Championships. London Fashion Week, on the other hand, is popular among tourists who have a passion for fashion. However, one of the most vibrant events that are held in the UK capital is the Notting Hill Carnival which was first organised back in 1966. The festival attracts one million people every year which makes it one of the biggest such events in the world. Any removal should be planned and handled with care. To ensure no damage or other problems you need to opt for a skilled, licensed and reliable man and van team, that will make sure the move is executed properly. We are by far the best option for London customers who want all that and more, with years of experience and a meticulous hiring policy of our remova experts.